Originally approached by a fan on Friday 4 May, he asked us if we would be willing to make t-shirts with the silhouette of the manager and "In Hoppy we trust" underneath. We got Beth onto it and did a mock up for him which he was delighted about. He then sent this to a number of his friends which started the demand for the tops. 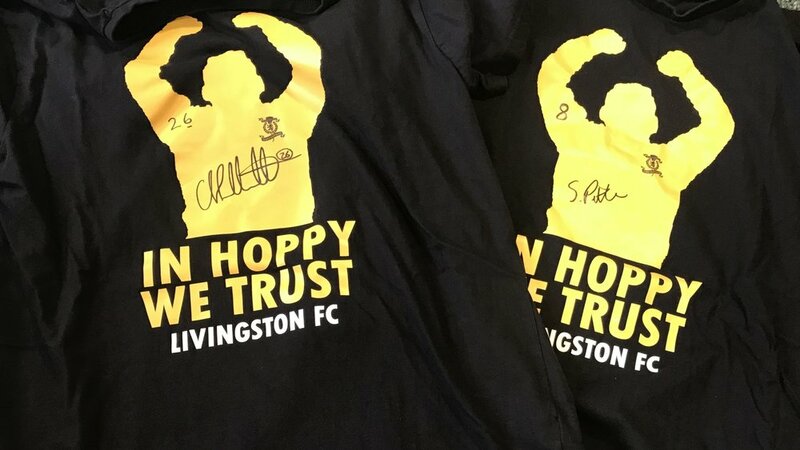 Livingston had their first big play off game at Tannadice against Dundee United on Monday 7th May which is when a number of the supporters wanted the tops for ... only 3 days later! We worked at the tops over the weekend and then one of the teachers was going to the game anyway and said they would hand out the tops to the relevant people. The top orders increased rapidly after this due to people seeing them at the game. The club were really supportive of the fundraiser and the assistant coach, David Martindale, approached us and ordered a top for each of the players to warm up in at their home leg of the play offs. The players wore them to warm up which also helped us market them and further increased our orders. The players then signed each of the tops and the club returned these to us for us to auction off to raise more funds for Singapore.